YOKOSUKA PERRY KUROFUNE-KANTAI offers special local dishes such as their "Special Fried Rice", "Barbecue Pork Bowl" and "Pork Cutlet Curry". 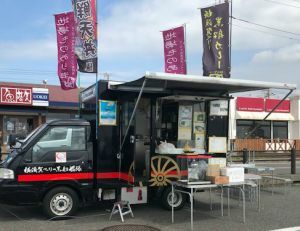 This food truck was modeled after the historical black ships (kurofune-kantai). It can be found around Yokosuka and other neighboring cities. Please stop by and try their delicious food. Link: For more information, click here.